Above is the front page of the newspaper size, eight page Proclamation No 1, in two sections, issued under the name of Dwight D Eisenhower, General of the Army, April 19, 1945, announcing his command as a victorious army and not as eliminators. It promises to destroy the national socialism and the German militarism and eliminate the rule of the National Socialist of Germany workers party. 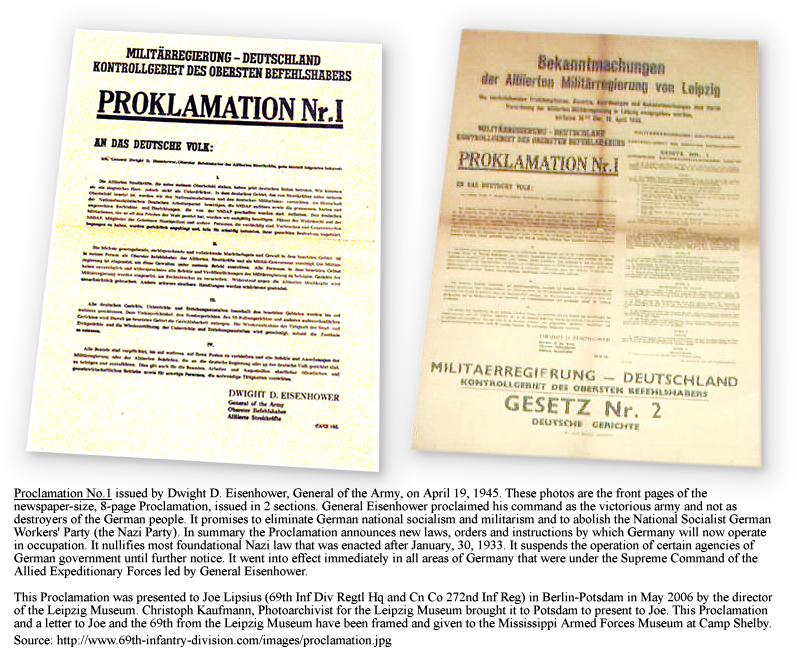 Stated briefly here, Proclamation No 1 proclaimed the laws, orders and announcments under which Germany would operate. It declared the abolishment of fundamental Nazi laws enacted since January, 30, 1933. It suspended the operation of certain establishments until further notice. It was effective in all areas of Germany under the Supreme Command of the Allied Expeditionary Force, Dwight D. Eisenhower, General of the Army, Commander. Left to right; Chris Kaufmann, Leipzig, Germany; Anne Lipsius, Norcross, GA; Edgar A. "Bud" Parsons, Chapel Hill, NC and Joe Lipsius, Norcross, GA; in front of the entrance to The Kongress Hotel, Potsdamy, Germany. 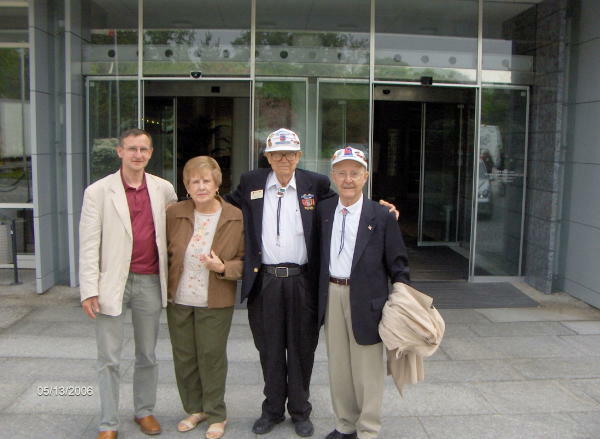 May, 12-15, 2006, Joe and Anne Lipsius, Headquarters 272nd Infantry Regiment; Edgar A. "Bud" Parsons, Co 272nd Infantry Regiment; and representatives from Great Britain, France and Russia were in Berlin-Potsdam, Germany for a belated 61st Anniversary of V-E Day Celebration. On Saturday, May 13, 2006, Christoph Kaufmann, Photarchivist, Stadtgeschichtliches Museum Leipzig, met the Americans in Potsdsam to present a copy of Proclamation No 1 on behalf of Dr. Volker Rodedkamp, Leipzig City History Museum Director. The Proclamation No. 1 gift was accompanied by a letter from Dr. Rodedkamp. Click on the small letter below to view full size. On return to the United States, after conferring with Paul N. Shadle, Co E 271st Infantry Regiment, President of the Fighting 69th Infantry Division Association, Inc., it was decided to send the Proclamation No 1 to be displayed in The Mississippi Armed Forces Museum, Camp Shelby, MS, where the 69th Infantry Division was activated, trained and departed from to overseas and combat. 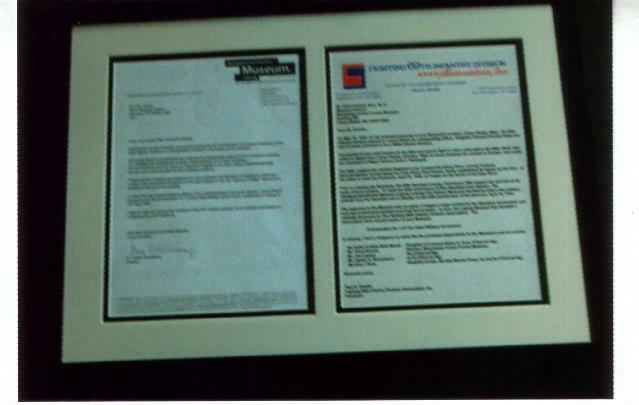 It was also decided to send Dr. Rodekamp's letter to the Mississippi Armed Forces Museum framed alongside Fighting 69th Infantry Division Association, Inc. President Shadle's letter ready for immediate hanging.